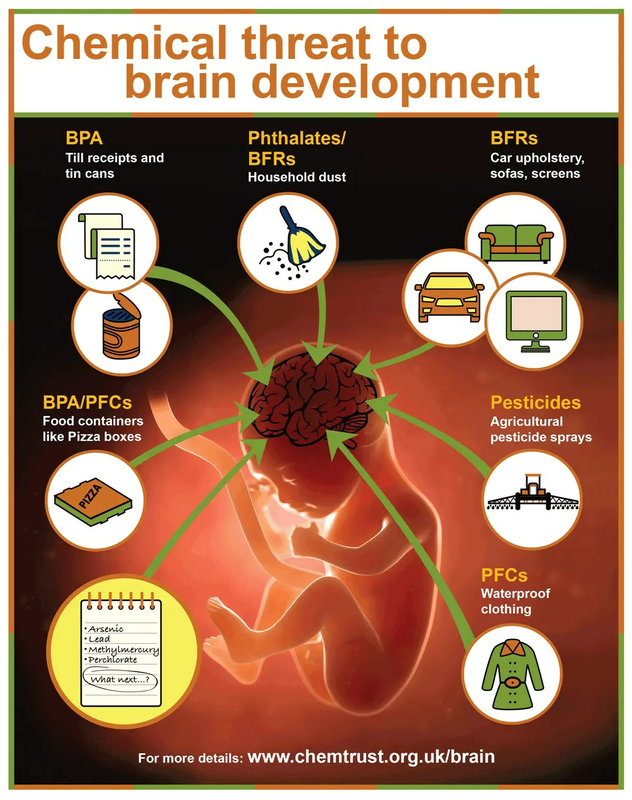 The impacts – which may include ADHD and lower IQ – are avoidable and can prevent children reaching their full potential says CHEM Trust, in No Brainer: The impact of chemicals on children’s brain development: a cause for concern and a need for action. Researchers have shown that many thousands of people have been exposed to now largely-banned chemicals such as lead and PCBs at high enough levels to have harmed their brain function. Now there is growing concern about the impacts of exposures to many of the ‘new’ chemicals in our 21st century lifestyles. Chemicals of concern include brominated flame retardants (BFRs), a group of chemicals added to furniture, electronics and building materials, per- and poly- fluorocarbons (PFCs), used for non-stick coatings or breathable coatings in everyday products including packaging and clothes. Some chemicals in these groups are being phased out, but similar chemicals remain in everyday use. The study also points out the unpleasant reality that children are constantly exposed to a cocktail of chemicals, which can act together, something which is still largely ignored by chemical safety laws. CHEM Trust proposes a range of policies that could help address this challenge, for example faster regulatory action on groups of similar chemicals, and development of new methods for identifying chemicals of concern. They also include advice for consumers on how to reduce their exposure. The report has been peer reviewed by two eminent scientists in the field, Professor Philippe Grandjean and Professor Barbara Demeneix. Complaints very strongly show a company how its products or services are perceived where it matters the most -in the customer’s mind. Complaint handling is one of the key indicators of how seriously a business takes its customers’ point of view. Complaints are to be expected from about any product; but their importance is all the more felt in an area like medical devices, because these products can affect the very life of their users. The FDA has a very clear and well-defined set of regulatory guidelines on complaint handling in the field of medical devices. These are set out in FDA 21 CFR 820.198. The FDA requires medical device companies to also comply with ISO 13485:2016 Section 8.2.2., which suggests what document procedures to put in place to ensure timely handling of complaints in a compliant manner. Just how seriously the FDA takes complaint handling can be gauged from the fact that deficiency in complaint handling is one of the top reasons quoted for issuance of 483’s by the FDA. Although complying with these regulations is a part of regulatory requirements; these regulations only mention what needs to be done in order to maintain a complaint and recall management system; how to do it is left to the individual medical device company. These regulations specify the exact elements of a complaint handling system, such as maintaining complaint files, proceeding about the complaints in a timely manner, documenting verbal complaints, and so on. However, it is up to the medical device manufacturer to implement the complaint handling and recall system in such a manner that it is perfectly streamlined and organized to the point where the complaint is handled exactly in the manner prescribed. The ways by which medical device companies can do this to optimize their complaint handling mechanism will be the teaching from a two-day seminar that GlobalCompliancePanel, a leading provider of professional trainings for all the areas of regulatory compliance, is organizing. At this seminar, John Kasoff, Director of Regulatory Affairs, Life-Tech, Inc. and Principal Consultant at Lean to Quality, LLC, who brings more than three decades of experience in Quality and Regulatory management, during which he has implemented and overseen quality system operations and assured compliance, at all companies of all sizes, from start-up to more than $100 million in revenue; will be the Director. Please visit Putting an effective complaint and recall management system in place to enroll for this seminar and gain thorough understanding of how to put an effective complaint and recall management system in place. This seminar has been pre-approved by RAPS as eligible for up to 12 credits towards a participant’s RAC recertification upon full completion. Jeff will emphasize the point that complaint handling is a highly coordinated, cross functional area for a medical device company’s Quality System. Almost all niche areas of the medical device company, such as customer service, sales and marketing, Regulatory Affairs, QA, R and D, and Quality Engineering, are involved in complaint handling. This makes the need for orchestrated coordination and synchrony between these departments a must, for if the complaint handling mechanism is not well lubricated; it is bound to make the complaint handling act a failure, inviting all the undesirable penal actions from the regulatory and enforcement agencies. John will highlight the role and importance of each of these functions in complaint handling. In these, activities relating to defining, documenting, and implementing a complaint-handling system, the requirements for complaint review, investigation, and corrective action, as well as ISO-specific implications, will be discussed in detail. He will also explain what constitutes a complaint, and will suggest recommended practice on the ways of handling “non-complaint” feedback. He will also show how to apply risk management to a complaint handling system, and explain a specific risk management system to drive home this point. A substantial part of this seminar will be spent on making a streamlined review of the regulations, at which the critical process requirements for compliance with the regulations will be examined in detail. Jeff will offer straightforward and compliant recommendations for the methods of documentation relating to complaint records, root cause investigations, and corrective actions, and show how to apply risk management principles to complaint investigation. Around 10-15% of the population has sub-syndromal Sad. These individuals struggle through autumn and winter and suffer from many of the same symptoms but they do not have clinical depression. And in the northern hemisphere, as many as one in three of us may suffer from “winter blues” where we feel flat or disinterested in things and regularly fatigued. The Process Design stage, which is called Stage 1, is when the organization defines the commercial manufacturing process. The knowledge that the organization has gained through development and scale-up activities serves as the basis for the development of this definition. The Process Qualification, or Stage 2, involves evaluating the process design for the purpose of determining if the process defined in Stage I has the capability for reproducible commercial manufacturing. The next stage of the FDA process validation stage is to determine if the Process Design stage and the Process Qualification stage give the ongoing assurance that the process remains in a state of control during routine production. This is what Stage 3, the Continued Process Verification, does. The ways of using Applied Statistics for FDA Process Validation will be the topic of a two-day seminar that GlobalCompliancePanel, a leading provider of professional trainings for the regulatory compliance areas, will be organizing. At this seminar, Richard Burdick, Emeritus Professor of Statistics, Arizona State University (ASU) and former Quality Engineering Director for Amgen, Inc., will be the Director. Please visit http://www.globalcompliancepanel.com/control/globalseminars/~product_id=901132SEMINAR?wordpress-SEO to register for this meaningful and highly valuable seminar on applied statistics for process validation. This course has been pre-approved by RAPS as eligible for up to 12 credits towards a participant’s RAC recertification upon full completion. The focus of this two-day course on Applied Statistics for FDA Process Validation is the various ways by which a systematic approach to implementing statistical methodologies into a process validation program consistent with the FDA guidance can be established. Dr. Burdick will begin with a primer on statistics, where he will explain how the methods of Applied Statistics for FDA Process Validation seminar can be applied in each remaining chapter. The two fundamental requirements for Process Validation, namely the application of statistics for setting specifications and assessing measurement systems (assays), will be taken up next. The next aspect of applied statistics Dr. Burdick will move on to is how to apply statistics through the three stages of process validation as defined by requirements in the process validation regulatory guidance documents. Since the methods taught through all these three stages are recommended by regulatory guidance documents; this seminar on Applied Statistics for FDA Process Validation will provide references to the specific citations in the guidance documents. The aim of this learning on Applied Statistics for FDA Process Validation is to lead participants into ways of establishing a systematic approach to implementing statistical methodologies into a process development and validation program that is consistent with the FDA guidance. Although aimed at the pharmaceutical industry, this seminar on Applied Statistics for FDA Process Validation provides a useful framework for other related industries, as well. He is the second person to die from flesh-eating bacteria since Hurricane Harvey struck the Gulf Coast. Two weeks ago, a 77 year old woman died after a fall inside her flooded home in which she cut her arm and subsequently contracted the flesh-eating bacteria. When the man initially presented to the hospital on October 10th, officials described an infected wound affecting the upper portion of his left arm. The aggressive and deadly soft tissue infection is formally referred to as necrotizing fasciitis . It’s a rare infection under normal circumstances, but if promptly recognized, diagnosed and treated with the appropriate antibiotics and surgery to remove dead or dying tissue, the majority of patients recover without any serious consequences. Necrotizing fasciitis, or “nec fasc”, is most commonly caused by Group A Strep , but a mixed infection with anaerobic bacteria including Clostridium may also develop, leading to what is commonly known as gas gangrene. Necrotizing fasciitis causes pain out of proportion in the affected area, relative to the degree of injury. A cut, scrape, puncture or any break in the skin may serve as a portal of entry for the dangerous bacteria, which then leads to destruction of blood vessels, fat, nerves and a white fibrous covering of the muscle known as the fascia. The infection then proceeds to enter the muscle, compromising blood flow and leading to death of the tissue. Its important to realize that bacteria don’t actually digest the tissue, but instead produce a deadly toxin that is responsible for the extensive tissue damage. As the bacteria enter the bloodstream, fever, chills and vomiting may rapidly develop, leading to a dangerous condition known as sepsis which is characterized by low blood pressure, rapid and difficult breathing and confusion. Early warning signs include severe pain and tenderness in the infected area, spreading redness and warmth and blue to purple skin discoloration, with darkened tissue in the later stages. The presence of gas or air in the soft tissue known as “crepitus” produces a crackling sound or crunching sensation if the area of skin is palpated. An abscess containing pus may also form as the infection becomes more organized. Necrotizing fasciitis is a surgical emergency. Aggressive fluid resuscitation along with broad spectrum antibiotics must be started promptly with emergent preparation for surgery to remove or debride the affected area in order to contain the infection. Persons with diabetes, chronic kidney disease and cancer who are receiving chemotherapy are most at risk for complications, due to poor blood supply to skin, muscle and soft tissue from having such chronic conditions. Flood waters harboring bacteria (from sewage), along with dirty surfaces or debris contacting the victim’s initial cut or injury, likely led to the onset of this aggressive and deadly infection. As a general rule, it’s best to keep all cuts or blisters covered with a dry gauze and waterproof type dressing if there is any potential to come in contact with floodwater or dirty surfaces or debris. The CDC describes about 700-1,110 cases annually in the U.S., the result of an active surveillance and reporting network that is set up to monitor such aggressive infections. Cases of typhoid and cholera, invasive and aggressive diarrheal illnesses typically associated with floods in developing countries, never materialized after the hurricane, according to data from the CDC. In addition, cases of tetanus, which can develop from heavily contaminated wounds after soil exposure, have generally not been a concern with such flooding in the U.S., as supported by data from the CDC. He also said it would be impossible for hospitals to conduct surgery only after lunch. Obesity and type 2 diabetes have been shown to increase the risk of complications after surgery. Heart health is already known to fluctuate over the course of a day. The risk of a heart attack or stroke is highest first thing in the morning, while the heart and lungs work at their peak in the afternoon. Dr John O’Neill, from the UK Medical Research Council’s Laboratory of Molecular Biology, said: “Scientifically it is not hugely surprising, because just like every other cell in the body, heart cells have circadian rhythms that orchestrate their activity. BBC Body Clock: What makes you tick? Other possible explanations for the findings included surgeons being tired in the morning or their own body clock affecting their surgical skill, particularly if they are not “morning people”. Corey Quinn is the CMO at Scorpion, an internet marketing company with offices located across the U.S. Patient behaviors and expectations are changing rapidly — and as a result, so is the world of healthcare marketing. With the rise of urgent care centers, retail clinics and telemedicine in recent years, consumers now have access to a more diverse array of healthcare options. They are also more involved with their care decisions due to higher health insurance premiums and co-pays. Furthermore, they have grown accustomed to finding answers to their healthcare-related questions in a matter of moments thanks to the internet. Unfortunately, there are still many healthcare organizations that have failed to adapt. Is yours one of them? If so, this has placed you at a significant disadvantage in your industry, which is only becoming increasingly competitive. Today, healthcare providers need to stay 10 steps ahead with healthcare marketing strategies or risk becoming irrelevant — or at least less visible — to prospective patients. Let’s explore three key strategies your organization can implement to gain the upper hand in the new healthcare marketing landscape. 1. Be present where the attention is: online. There’s no doubt about it — attention has shifted to the internet. Consider the fact that 88% of U.S. adults use the internet today, compared to just 52% in 2000, according to data from Pew Research Center. And this trend isn’t limited to younger generations: Americans age 65 and older have been identified as the demographic with the fastest internet usage adoption rate since 2000. Prospective patients are now more inclined to use the internet to look up information related to their healthcare. Google reported that one in every 20 Google searches are for health-related information, and a Pew Research Center survey found that 62% of smartphone owners have looked up health information on their phones within the past year. With the upswing in popularity of mobile devices, accessing the internet has become easier than ever — making it inevitable that patients will continue to rely more heavily on digital media. The best way for healthcare organizations to reach their ideal audiences and increase brand awareness is to go where patients are already dedicating their attention. They need to invest in more online marketing efforts and claim a presence across various digital channels, from their websites to search engines to social media platforms like Facebook and Instagram. 2. Think about the patient’s online experience. Remember, online user experience matters — just like patient satisfaction matters in the treatment room. In many cases, prospective patients will research your healthcare services and facilities online before scheduling an appointment. If their first experience interacting with your organization is a negative one (even if it’s online), they may be left with a poor impression and choose another provider. • Does my website have a modern and mobile-friendly design? • Is it easy and intuitive to navigate? • Does it immediately answer the visitor’s most important questions? • Are my social media posts and ads relevant to my target audience? • Are my posts and ads actually driving engagement?